Toop&Toop Blog: Adelaide – what a city! Adelaide – what a city! Adelaide is fast becoming the most popular city in Australia for travellers from overseas to lay their hat and call “home.” International visitors are taking up residence in our City of Churches because of affordability – it costs an amazing 18% less to reside in Adelaide than the country’s most expensive state, Sydney, and they are buying up our properties! Within only the last few weeks we have had a large number of overseas couples come through opens, fall in love with our homes and subsequently snap them up! Recently we sold 3 properties in Golden Grove and Gulfview Heights to couples from the UK who have decided to settle down in Adelaide to raise their families and make Adelaide their home. 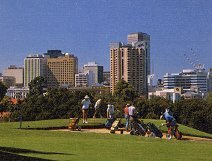 The word is out that the quality of life is far better in Adelaide than any other capital city in Australia. Overseas buyers are looking for family homes, with pools, plenty of open space and a leafy green environment – something that can be very rare for couples coming from overseas. Not only are we selling to overseas buyers but we are also making record sales. A beautiful two-story home at Golden Grove's exclusive Spring Hill development sold for $910,000 last weekend. It is the highest recorded price for the area and was achieved by our Golden Grove team. Once upon a time, these prices were only achieved in Adelaide's leafy eastern suburbs. We are finding now that areas such as Golden Grove, Mawson Lakes and Port Adelaide are flying. Both areas are seeing a lot of well-planned development and together with their proximity to jobs in the new defence industries, they provide a winning formula. So if you are looking for a property to buy or would like some advice on where to buy please give us a call to discuss your buying requirements.